This combination wrench series has a standard open jaw one end and a bi-hexagon (12 point) ring the other which ensures positive grip on even the most stubborn and worn fasteners. The spanners have a shinny mirror finish. Each item is made from high quality chrome vanadium steel. Chromium-vanadium steel refers to steel alloys incorporating carbon, manganese, phosphorus, sulphur, silicon, chromium, and vanadium. Chromium and vanadium both make the steel more hardenable extending the life of the tool considerably. Chromium also helps resist abrasion, oxidation, and corrosion. 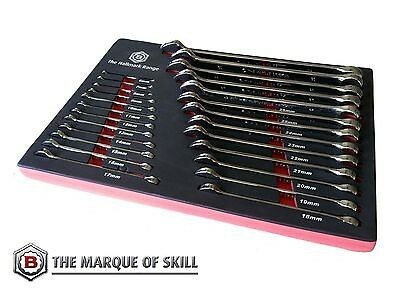 Each wrench has a high quality mirror finish. In the unlikely failure of a Britool Hallmark product in normal use, it will replaced or repaired as appropriate. This guarantee does not extend to fair wear and tear.